If you’re looking for beautiful scenery, amazing beaches, an artistic haven and a European vibe, Carmel is the perfect option for your honeymoon. Couples looking for a remote location for their romantic getaway should opt for a Carmel honeymoon. With no chain restaurants, no street addresses and Clint Eastwood as a former mayor, Carmel is a town that works hard to retain its charm and appeal. It offers eclectic inns and romantic B&Bs with luxurious amenities for visitors and (especially!) honeymooners to enjoy. The California destination also features award-winning restaurants and provides couples a romantic sunset almost every night. You and your S.O. can spend your morning strolling by the sea or exploring the many art galleries and designer shops before driving along Scenic Road and Point Lobos for an unforgettable experience. Outdoor enthusiasts will also love this honeymoon destination because the area is known for having some of the best beaches, hiking trails and golf courses. Whether you spend time exploring the 100 art galleries, indulging at the wine tasting rooms, surfing the Pacific or lazing on the beautiful beaches, Carmel offers the perfect balance for any honeymoon. Start planning your Carmel honeymoon today. September to November are some of the warmest and sunniest months and is a perfect time to take your Carmel honeymoon. Fall is actually known as the “secret season” by locals because of its sunny weather. Carmel also attracts a lot of tourists during the summer, but this is also the foggiest season. Coastal fog can hang around almost all day during June to August, which can make mornings and early afternoons cooler than usual. So, be sure to pack lots of layers if you’re planning a take your Carmel honeymoon over the summer. The winter sees mild temperatures in the 60s and offers honeymooners a chance to explore deserted beaches, wild waves and maybe catch a glimpse of the migrating humpback whales. Spring sees better weather and many food festivals pop up in town during late April and early May. 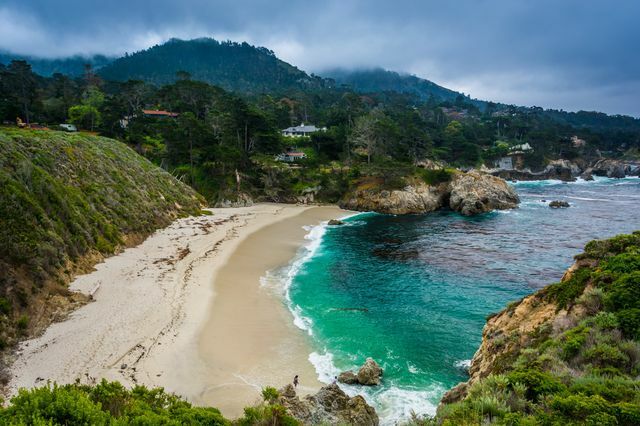 Chill Out on the Beach: Carmel is voted as one of America’s top beach towns so days spent lazing on the sand and exploring the different beaches is a must! Make S’mores: What could be a better way to end the day than making s’mores over a beach campfire, nestling into your spouse. Laid back California honeymoon??? Suggestions?